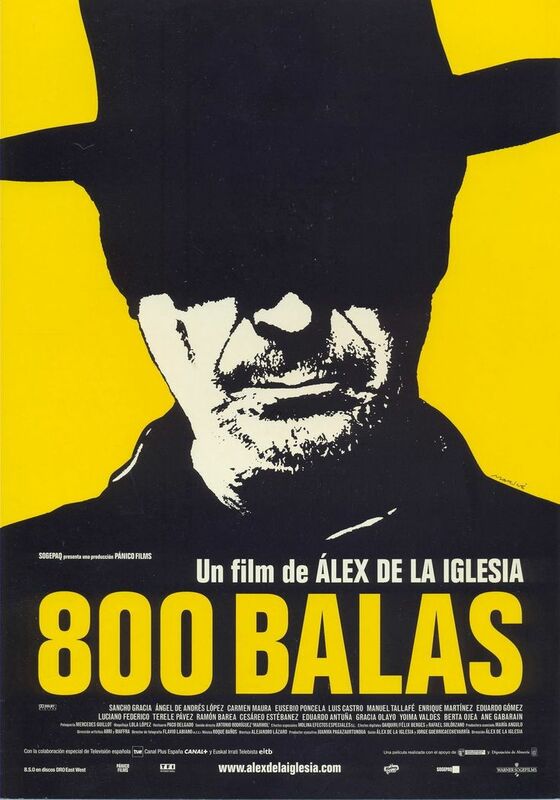 Álex de la Iglesia has easily been my favorite Spanish director of the last twenty five years. Though the film wasn’t well received here at the time, I myself was thrilled as I found Perdita Durango to be exactly the kind of ugly yet engrossing genre film that was so desperately needed during that mostly whimsical decade of arthouse cinema. Since that screening, I have been a loyal fan of the director’s work due to his absurdist and often purposefully and excessively violent and sexual view of contemporary society and his and screenwriter Jorge Guerricaechevarría’s unique ability to exalt traditionally marginalized characters. We sat down with Álex de la Iglesia before a retro screening at the Laemmle Ahrya Fine Arts Theater of his hysterical 2004 department store Dante’s Inferno, El Crimen Perfecto, (The Perfect Crime). FOG! : I have read in the premise of My Big Night, which is screening at the Music Hall Theater here in Los Angeles on Saturday, April 16th. The character of Jose is a “seat filler,” and I must be honest that until I saw the episode of the American sitcom Seinfeld when Kramer gets a job as a seat filler for the Tony Awards, I had no idea that such a job existed. What was your inspiration for Jose’s character and the film? Álex: My inspiration for the character of Jose came from my many years of working in the theater and getting to know people who actually did that type of work for a living. I myself eventually became a “seat filler.” I was also an extra, so I have always wanted to tell a story from those peripheral points of view. That description reminds me of Julian, one of the main characters in your film 800 Balas (800 Bullets). It is my favorite of your films, in fact, because I am Italian and have often wondered about the extras in all of the spaghetti westerns I’ve seen. It is a consistent theme that runs through many of your films, the view of the extras. Álex: I have never thought about that, but it’s true. For me, the character of the extra is very important, for it is the symbol of life, and that is why I always emphasize the role of the extra because everybody is a part of the main story and not everybody can be a main character. I also love telling the story from the point of view of the underdog or the villain and flipping the storyline so that those characters can shine and be in the forefront. You’ve written My Big Night with your regular screenwriter Jorge Guerricaechevarría. You have been working together since your first short film, Mirindas Asesinas from 1991. What is your writing method like? How do you prefer to write together? Yes, the only film that I have ever directed that had a script that Jorge didn’t co-write with me was 2010’s Balada Triste de Trompete (The Last Circus), which I wrote on my own. That was not because we were having any issues between us; it was just that during that time, he was already working on something else. The way we work together is a very relationship based work ethic where we spend a lot of time together, bouncing ideas off of one another as opposed to the typical process of sending off a script so that the other can write notes. Essential to our success is the way that we choose to work together. I can work the more traditional way of sending off scripts and waiting for notes to come back, but I have more fun doing it this way, and the ideas flow better, and we have a great time doing it this way. There are many references in your film 2004 film, El Crimen Perfecto, (The Perfect Crime) which is screening here at the Fine Arts Theater tonight, to Luis Buñuel’s Ensayo de un Crimen (The Criminal Life of Archibaldo de la Cruz). Was Buñuel yours and Jorge’s most important influence as writers and filmmakers? That film is a great inspiration for us, and we even went as far as to put that film in our movie. Since the beginning, Jorge and I have had the films of Buñuel in the back of our minds. He is such an inspiration to us. This is the hope of The Perfect Crime–that you will not expect things that you would see in a normal film based on the kind of inspiration that Buñuel has given us. Buñuel and Picasso were two of the greatest artists of the 20th century, both from Spain, and both had to escape Spain as well. One had to work in Mexico and the other in France. Do you feel that they left because of Franco? No, not because of Franco, but because of the people of Spain. Spaniards tend to hate other Spaniards because of petty jealousy. As we are envious people, we want something that we cannot have, so we want someone from another country or someone who does not act anymore and even someone who is dead. Yes, dead people or foreign people–that’s what we want, and this is seen as normal. (laughs) At the same time, we (Spaniards) are very proud of the work that men like Buñuel and Picasso have done. You explore the danger of that kind of jealousy in your film, The Last Circus, which has two circus clowns symbolically representing the Catholic Church and Franco’s rule going at one another over the love of a woman. Yes, it is about Spain, the Church, and Franco as a kind of character. Now, there is no Franco in Spain, but yet there is still the same kind of rage against people, which leads to fighting one another all of the time. The people in my new film El Bar, which is in post-production, also shows this constant fighting between each other. The film is about a group of regular people who become trapped inside of a bar because there is a sniper outside who is shooting people and how they deal with one another. That clip was very funny, and it keeps with your theme of typically peripheral characters becoming the center of the story. I understand that the film stars Blanca Suárez, Mario Casas, and Carmen Machi, whom you’ve worked with before. Do you now have them in mind when you and Jorge are writing the characters? Yes, most of the time I do, but not with all of my actors.